My Dad’s birthday and Mother’s Day are both the second week of May so I try to get home each May for a visit. As it turns out, it is also the prime time for a visit to one of my favorite areas in Virginia – the Mount Rogers National Recreation Area. Covering over 200,000 acres in southwest Virginia, the Mt. Rogers NRA contains four wilderness areas, mountain balds, high elevation spruce-fir forests, 500 miles of hiking trails (including a portion of the Appalachian Trail), beautiful mountain streams, wild ponies, and is adjacent to my favorite Virginia State Park, Grayson Highlands. But in early May, the place to be is Elk Garden. Easily accessible via Rt. 600, Elk Garden lies between the two tallest peaks in Virginia – Whitetop Mountain to the west and Mount Rogers to the east. Everyone seems to love trilliums. They tend to be big and often showy with bright colors. 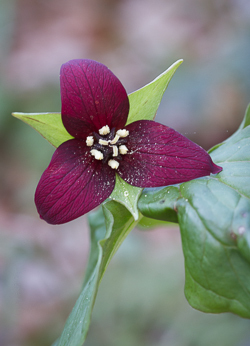 The name trillium refers to the “threeness” of these plants – three leaves, three petals, three sepals, and fruit with three ridges. 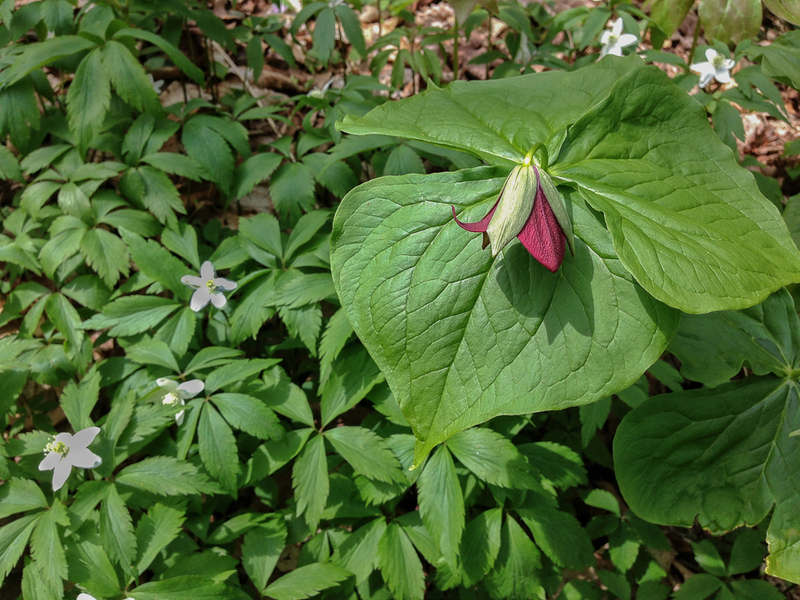 The name, Wake Robin, refers to the blooming time of this plant (and other species of trillium) which often coincides with the return of robins in early spring. This particular species also goes by several other, less flattering names, including Stinking Willie and Stinking Benjamin, both of which refer to the unpleasant aroma of the blossom (go ahead, get down and stick your nose up to it the next time you find one). Lacking nectar, these flowers rely on deception to bring in pollinators which are primarily flies and beetles that are typically attracted to dead animals. This species is primarily a red-flowered one, which, when combined with the foul odor, mimics decaying flesh which attracts the pollinators. Less commonly they have white flowers, and even rarer still, are yellow-flowered plants. The petals on all varieties tend to turn pinkish with age. The flowers of this species nod toward the ground making them somewhat less noticeable, although the distinctive leaves quickly draw your attention. 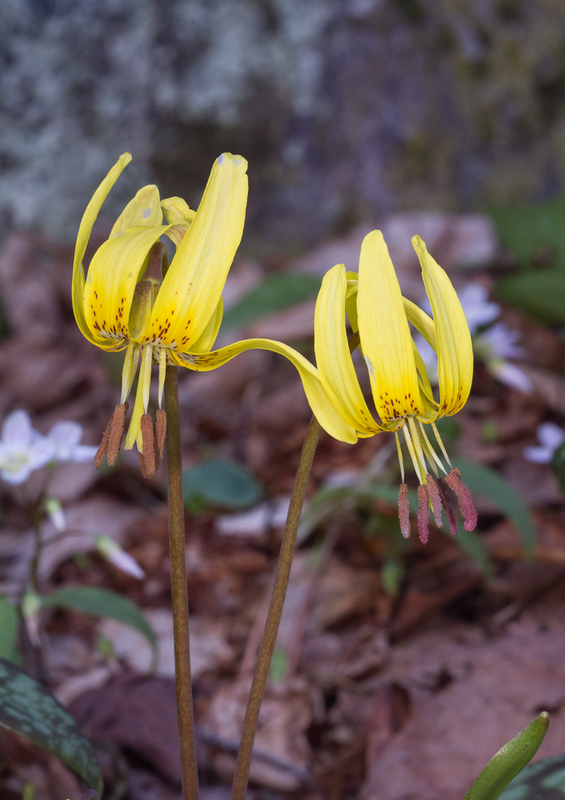 The bright yellow Trout Lilies cannot be overlooked – they stand out against the surrounding greenery for your attention as you hike. Only a small percentage of the plants usually flower in any season (some references say less than 5% typically). Flowering plants have two leaves whereas the vast majority in a population have only a single leaf. The upside down flowers close every night and the petals and sepals re-curve upward again every morning during their short blooming period. 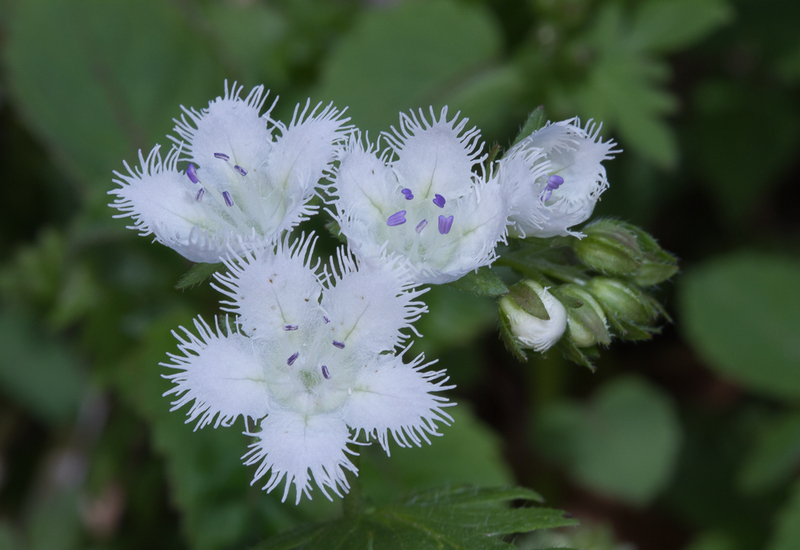 High on my list of favorites is the Fringed Phacelia, a low-growing annual that can blanket the forest floor with a carpet of white that resembles a late-season dusting of snow. The delicate fringed petals reward any hiker that kneels for a closer look. Some species of Phacelia in the western U.S. apparently contain compounds that can itch and sting causing a skin rash similar to poison ivy and giving the plant the unkind name of Scorpionweed. Spring Beauties appear to pop up from almost every available space in the ground cover at Elk Garden. They can be quite variable in the amount of color in the striped petals (this specimen was noticeably brighter than most). They have a tasty edible corm and are the primary source of nectar and pollen for the aptly-named Spring Beauty Bee. This foraging bee looked like it was wearing pinkish chaps due to its full pollen baskets (Spring Beauty pollen is pink). 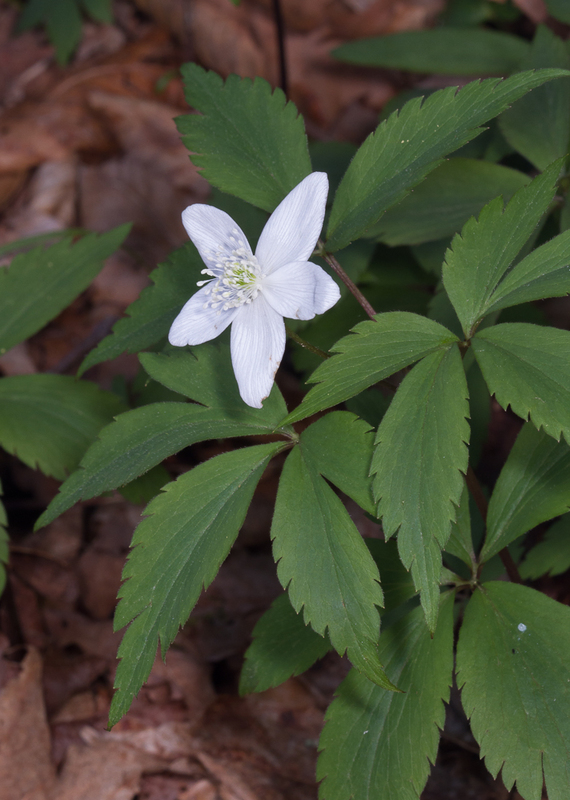 Like most of the spring ephemerals (those woodland wildflowers that bloom before the trees leaf out reducing the amount of light that reaches the forest floor), Wood Anemone has a short growing season of only a couple of months. Plants spend most of the year dormant as an underground rhizome. 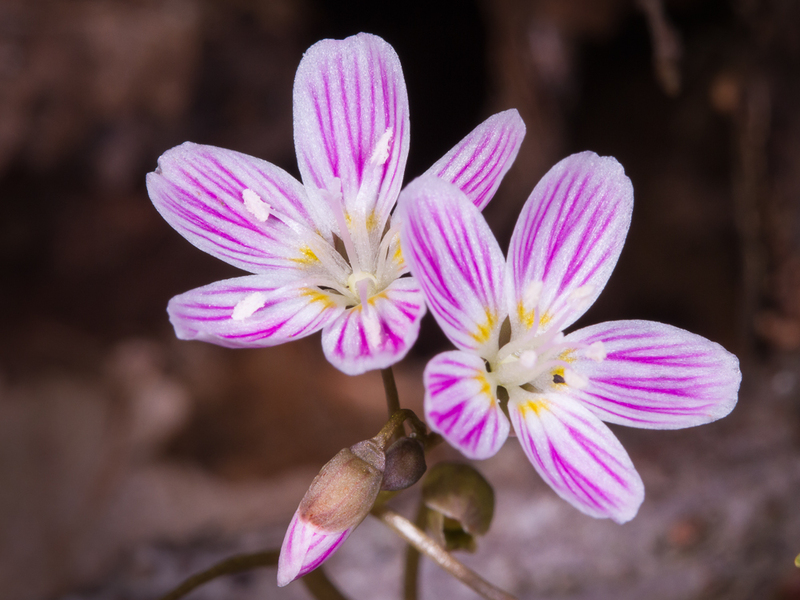 Studies have shown that these and many other spring ephemerals are now blooming earlier than they did just decades ago due to warming temperatures associated with climate change. One study of Wood Anemone showed they bloom an average of 15 days earlier now than they did in the early 1970’s. Violets are scattered all along the Elk Garden trail. 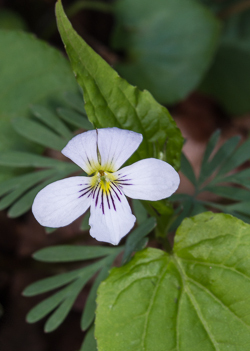 In addition to the well known purple-blue colored species, there are white and yellow violet species in this rich cove forest. 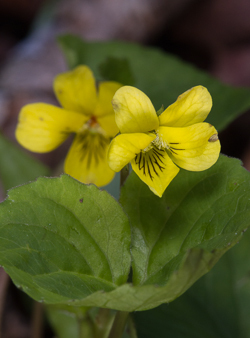 Violets have two types of flowers – open and closed. 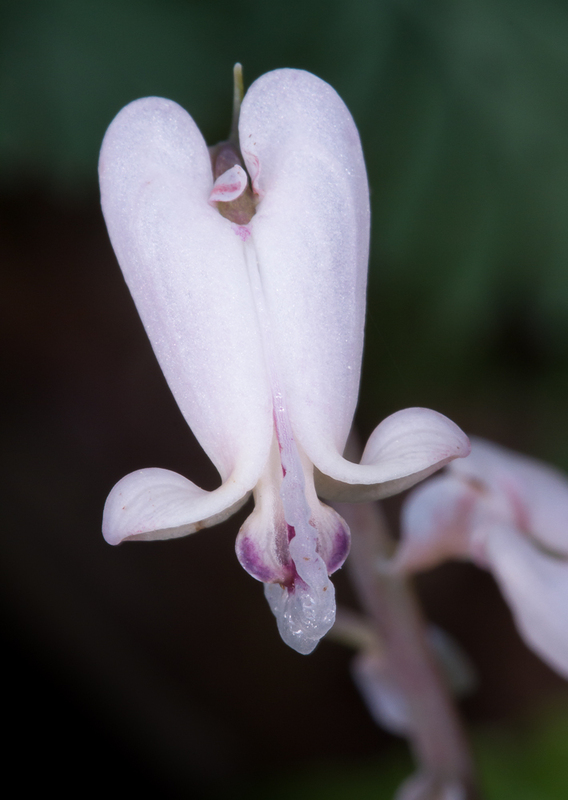 The closed flowers (called cleistogamous) are often partially hidden under the leaves and are self-pollinating, ensuring at least some seed production even in years of poor pollinator success. The plant that gives me the greatest delight when I find one along the trail is undoubtedly Squirrel Corn. The delicate, blueish-green foliage and unusual blossoms of this plant often occur in dense patches and immediately catch your eye. 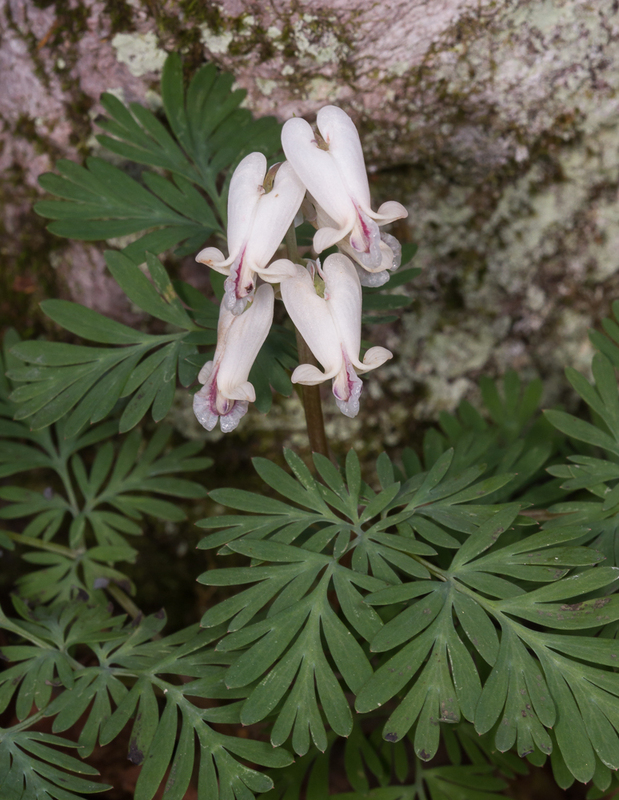 The flowers are somewhat heart-shaped with the upper lobes being more rounded than in the plant’s close relative, Dutchman’s Breeches. Squirrel Corn gets its name from its underground food storage structures, which look like corn kernels. 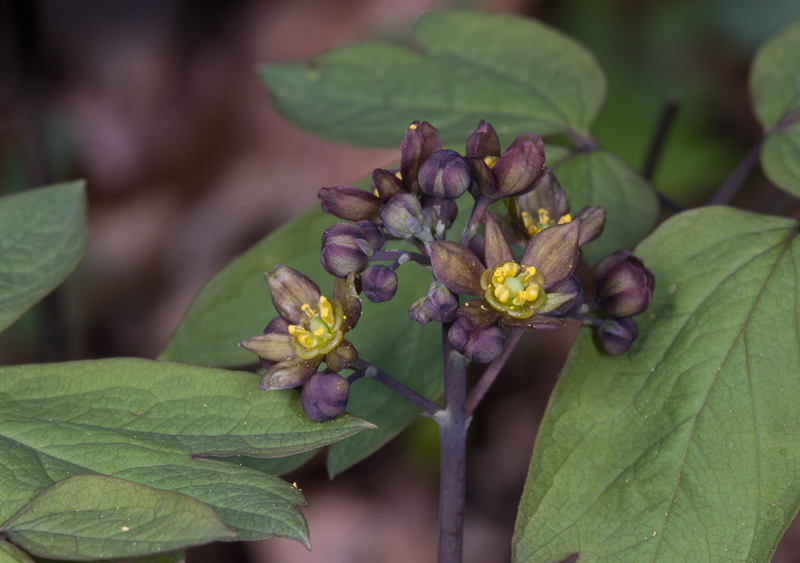 A variety of other species carpet the ground throughout early spring along this section of trail including Blue Cohosh, Yellow Mandarin, False Hellebore, Jewelweed, Umbrella Leaf, Solomon and False Solomon’s Seal, Twisted Stalk, and many others. 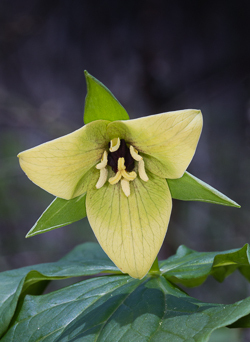 The region is so rich in wildflowers, birds, and other natural wonders that the local community center hosts an annual Mount Rogers Naturalist Rally each May with speakers, hikes and other programs. 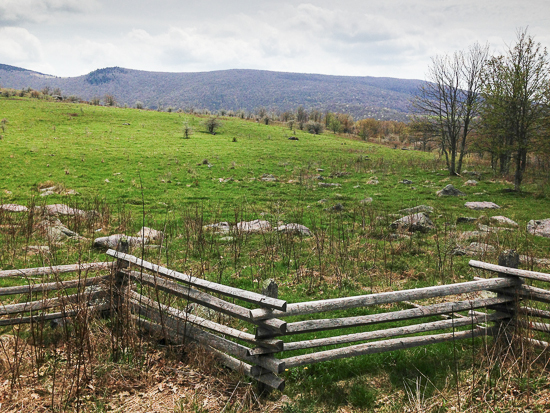 While this area is beautiful any time of year, spring in these mountains is truly spectacular.